Left-handed Outfielder, 1890-1905. Played for the New York Giants, 1890-91; Cleveland, 1891-1902; St. Louis Browns, 1902-05. 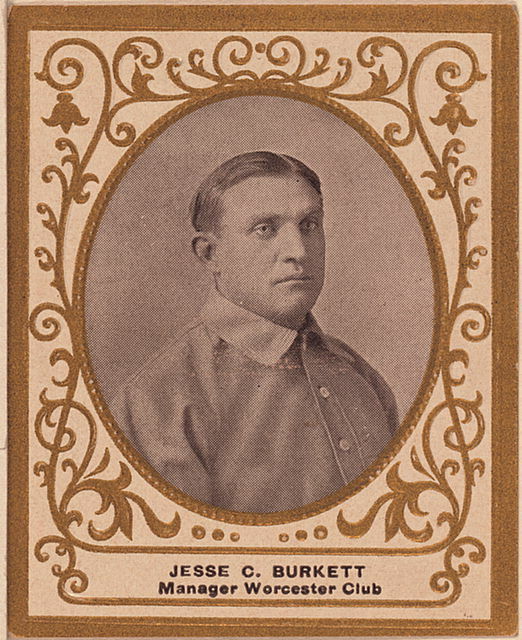 Jesse Burkett was noted by sports' writers in the late 1890's and early 1900's as the crabbiest player on the baseball diamond. He was always bitching, complaining; a real sourpuss. Even the umpires disliked Burkett and positioned themselves far away from him. If a call went against him, he crabbed nonstop for the rest of the game. The Giants signed Jesse in 1890 as a pitcher. He was 3-10 in pitching with an ERA over 5.00. Jesse was moved to the outfield where he hit .309 but his fielding was very poor. . Playing outfield in 1892 he hit .278 but his batting average soared to .348 in 1893. He made 46 errors! At that time the glove was made out of leather and designed to protect one's hand not to help catch the ball. All regular playing outfielders made at least 20 errors a year. In 1895, Jesse led the league with 225 hits and batted .409. Height / Weight: 5' 8" / 155 lbs.